Powerful, intuitive simulation software that anyone can use to get results fast. Improve processes, increase efficiency and reduce costs. 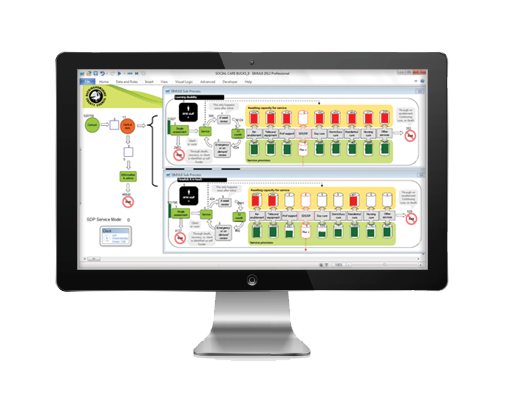 SIMUL8 software is used by simulation teams in organizations worldwide to make risk-free decisions. "SIMUL8 allows us to run experiments on our business processes before we implement them, saving time, investment and effort in change management. There is almost no scenario we can’t simulate. The bang for the buck on SIMUL8 is astounding." Simulation enables organizations to make bold, confident decisions by providing evidence to be sure you are making the right choice. How does it work? You create a visual mock-up of your process, similar to drawing a flowchart. By adding timings and rules to the tasks, resources and constraints that make up your system, the simulation will accurately represent the real process. You can then experiment with changes and the simulation will measure exactly how the process will perform in the real world.